Soon after my marriage in 1985 in Delhi, we moved to Chennai. I was overwhelmed by the amount of music in the city. Having grown up in Delhi in a musically inclined and talented family, it was but natural that when I mentioned Chennai everyone would say—"Anga nallaa paattu vriddhi pannikalaam"
Coming here, my head went for a spin. The place was chockablock with Vidwans and Vidushis--- who to learn from?? I did approach one or two eminent musicians but it did not work out. It was sheer providence that brought me to Rajam Sir. His youngest sister was my neighbor and during a casual conversation gave me his address. (He had no telephone then and still detests one!) The Musicians' dairy was not there those days! I had heard about him and my parents were great fans of his music. So with great excitement and anticipation I arrived at 41 Nadu Street, Mylapore, Chennai 41. What would he be like? What will he ask me to sing? What would his reaction be? So on and so forth my mind was on its own orbit. Rajam Sir looked every bit like his brother S. Balachander. He asked me my background and asked me to sing something. I remember I sang Thyagaraja's 'Emi jesithe' in Todi and he asked me to continue with Niraval and Swaram. He was most appreciative and wanted to know if there was something specific I wanted to learn! 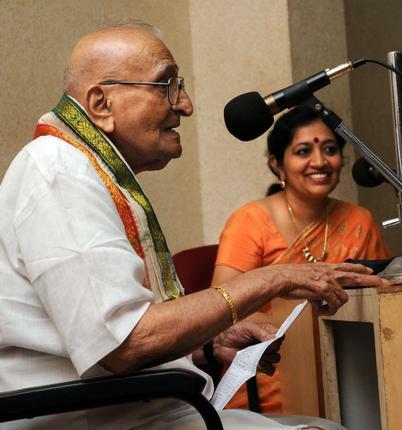 The first song Rajam Sir taught me was Muthuswami Dikshitar's 'Hiranmayeem Lakshmeem' in Lalitha. It is still one of my favourites. Thus began my association with Rajam Sir. His classes were always fun. I was intrigued by the Melakarta ragas and his obvious mastery over them. I began learning a few Kotiswara Iyer songs. My earlier training in Delhi under eminent vidwans helped me to grasp the subtle nuances of these ragas. Rajam Sir would teach cascading sangatis as they occurred to him in class. He always had only a skeletal notation of the kritis and felt one should develop them according to ones manodharma. To him this was child's play! Rajam Sir's teaching methods were also unusual. He would teach you the sangatis and help you understand them. If one is not able to reproduce it correctly after many attempts, he would modify them to suit the student's voice and ability. The sangatis would have a natural progression such that it would be easy to remember. Perhaps, because of his virtually fresh approach to the songs each time, his renditions also seem equally fresh to me. He always felt one owed it to the composer to present the song in the way he may have conceived it. While one has the freedom to introduce sangatis, one must not interfere or mutilate the basic structure and spirit of the song. He had the utmost respect for the great composers. Another unorthodox aspect of Rajam Sir's teaching was that he would encourage the student to think about the song or raga and sing fresh sangatis, if possible. He was most catholic in his outlook. He would often be appreciative of songs that I had learnt earlier under other Gurus. In fact, in one instance he wanted to 'learn' a particular song for a lecdem that he did not know and I didஸ.. He would tease me saying 'Will you please teach it to me? Unga paattu ma adhu!"!! Rajam Sir was very well informed about most things. He knows exactly where to buy what - 'Masala Bun' from Soumiya Bakery, 'Medhu Pakoda" from the Pakoda shop on Mathala Narayanan Street, 'Hot Bajjis' at the Woodlands Drive in at 4 pm and so onஸ. He loves a Crisp dosa and Banana Split ice cream—he was very particular that my son Prashant not miss out on this ice cream while we were at the Woodlands!! With my husband, he would discuss the insides of a motor bike or a car with as much interest and knowledge as the construction of our house. With his interest in painting, his knowledge of temples and mythology is phenomenal. He had deep interest in architecture and could tell you many things about places you would never have known. He had intimate knowledge of many temples, having stayed there under very trying circumstances to make copies of frescoes, etc. He was in complete awe of the artists who have made frescoes. He would make a fresco like painting on the wall in his house on the occasion of 'Varalakshmi Pooja' every year and that's when he realized what a challenge it is to make a fresco!! Rajam Sir was most outgoing in his attitude. He was rather unorthodox in his approach to most things. He was not a religious person in the conventional senseஸ ie, he didn't believe in visiting temples or being ritualistic. But he would not interfere or criticize people who are. He enjoyed the puranic stories and the rich imagination displayed therin. He was intrigued by the logic behind many of the tales or depictions. For instance, he would say, it is so appropriate that 'Agni' is depicted with three legs—you never know which way the flame will dart! He was amazed at the foresight in associating an animal, a plant, a tree, a cereal, a colour, asound, an instrument and so on with each of the deities—this is the earliest example of conservation of the environment! To him, his work was worship. He was more in awe of the magnificence of our art forms and the fertile imagination of our artists who have translated these into forms for us. He was appreciative of the research minded westerners who do a comprehensive job of studying a subject in depth. He had read widely about art and music. He was fond of animals and well informed too. He had a detailed discussion with my daughter Shankari on the habits of lions on the eve of her visit to the Gir forest! I have seldom seen Rajam Sir sit idle. He was always painting or teaching music. Else, he would be contemplating on the painting underway or a new project. He was always desirous of sharing his knowledge with all. He would go to great trouble to explain the aarohana and avarohana of a new raga that he was to sing. He was never keen on proving himself or his talent—it was always to inform people and enhance their understanding. Even the programmes he produced while in All India Radio were in this mode. They still bear the test of time and their rebroadcasts are immensely popular. His attitude was just amazing—he would say that since his job and salary in AIR were assured he could afford to take risks professional musicians could not. Worst case, listeners always had the choice of switching off their radio sets if they did not like it!! An incredible aspect of Rajam Sir was his interest, ability and meticulousness in documenting his scripts. It had to be seen to be believed. This kind of documentation and filing of material would put any library to shame. And it was all written by handஸஸ..and in perfect alphabetical order and cross indexingஸ. In spite of Excel sheet and Word, sortin and filtering, one finds it tough to spend the time and effort on these details!! Rajam Sir also had quite exotic tastes and enjoys cakes, crackers, cheese, Marmite (my Badam barfi and Vangi baath) and the like! He had no time or energy for dressing up fancily but he does love his rings with their precious stones and will always wear them while going out. His attitude was very unique. He had the remarkable ability of sizing up people for what they are. He was not easily influenced by others and 'what will others think' is something that never bothered him. He was perfectly capable of setting aside personal feelings and going ahead professionally. Often times he would have healthy respect for a person's talents, even if he did not approve of him personally. He was not prejudiced. I could go on about Rajam Sir endlessly. As someone jocularly said once "He is not a 'Raw-gem" but a highly polished one! It has been my 'sukritham' that I have such an association with so great a person.